I've been rather remiss in chronicling my trip last year to the UK and Ireland. I've covered most of it, in previous posts, but there's yet more to share. 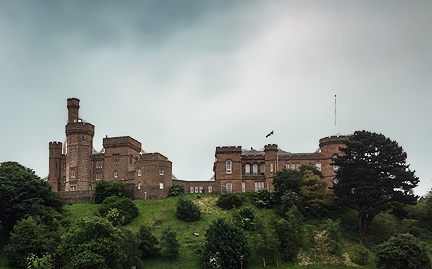 While the current castle, which houses the Inverness Sheriff Court, was only constructed in 1836, a castle has stood on this spot since the 11th century. Most of the structure is not open to the public, but visitors can get a great view from the north tower. The first structure here was built by Macbeth (yes, THE Macbeth), then later it was razed by Mael Coluim III and a new one erected. Basically the process continued several times. 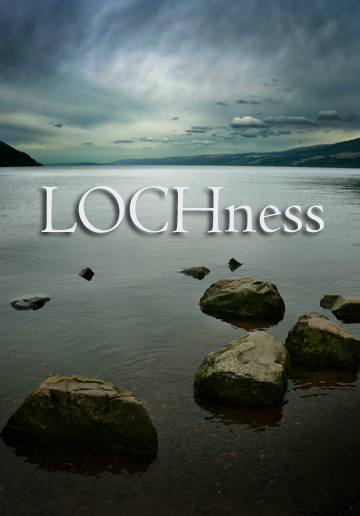 23 miles long and deep enough to nearly submerge the Empire State Building, Loch Ness is the center of legends and mysteries stretching back centuries. Most notable among these, of course, is that of the Loch Ness Monster, but to be sure there are other tales to tell as well. As for explanations of what the creature might be, there are some remote theories beyond logs and lies. For instance, Bottlenose dolphins and Harbor porpoises have never been recorded in the Loch itself, but they have been spotted in the River Ness, so it might be possible that errant specimens could attest to at least some sightings of the oft-reported creature. As I have talked about previously, the a pod of such animals breaking the surface in the typical arch-backed manner of mammals could explain the "humps" many witnesses have reported seeing in the water. Another suspect in the case of Nessie might be sightings of the critically endangered European Sea Sturgeon. This rare fish can, in extreme specimens, reach upwards of 20 feet in length and weigh as much as 800 lbs. Could it have been something like these animals that caused the tragic death of John Cobb who fatally attempted a water speed record in 1952 when his boat, Crusader, struck an unexplained wake? Or is it less of a stretch to think that some fantastic, unrecognized animal does lurk within this storied lake's murky depths? Urquhart castle has another legend: Beneath the castle are two sealed vaults. One contains an unbelievable treasure; the other a terrible disease. As the legend goes, the fear of this unleashed plague has been sufficient enough throughout time to prevent anyone from tossing that particular coin. Even 50/50 odds don't warrant the horrible death should one choose the wrong vault. 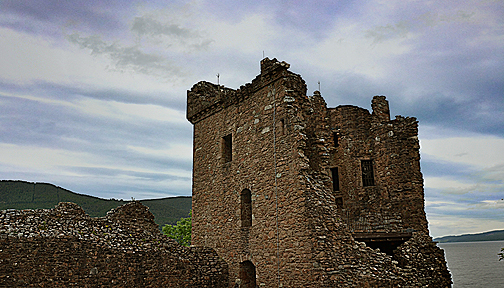 It's also believed that Spanish gold funded the Jacobite Army as it fought to hold the castle. After the defeat of Culloden in 1745, 7 crates of the gold were hidden away. Some say it lies in the nearby forests while others are convinced it remains hidden somewhere either in castle or in the Loch itself. There are Templar tales loosely tied to the castle as well, such as the treasure of King Baldwin II after his death in 1131. Much of it is reputed to have been taken to Rosslyn Chapel near Edinburgh, but some may have found its way to Urquhart. If you're driving around Lake Worth in that eponymous North Texas city, and you find yourself following the sinuous, shadow-laced trail of Heron Drive, you'll see many lovely lake homes. Then suddenly you turn a bend to discover something monstrous that practically begs you to scream, "Dammit, Janet!" Oh, how I wish it were a dark and stormy night right now. Alternately known as Inverness, The Castle at Heron Bay, or simply The Castle is a rambling structure of towers and turrets that has crouched derelict among the shadows of Lake Worth for years. The 6500 square foot crenellated stone structure that rests upon 14 acres of lake shore property was said to have been constructed in 1940 to enshroud a much older home dating back to the 19th century, yet there isn't much in the way of data to support this and there are many conflicting "facts." According to the real estate website Zillow, it only has 3 bedrooms and 2 baths, a surprisingly large footprint for a home that sleeps so few. Next door is small guest cottage from where a fearsome dog bays at anyone who wanders too close. Additionally, a daunting chain link palisade topped with concertina wire further cordons the property from unwanted intrusion. According to some records, the property first belonged to Ulrich Cannon, who purchased the land in the early 1860s. Then Julian Field took on the land. After his tenure, Charles Turner and his family took up residence from 1873 to 1894. Twenty years later, a large portion of the land was deeded to the city for the construction of Lake Worth in 1914. Legend tells that the owner and builder of the original structure found his betrothed floating dead in the lake. It was never clear whether she drowned accidentally or not, but the groom was curiously undeterred in his marriage plans and proceeded to wed her sister only a month later. Since that time, a woman in a long white dress has been spotted fleeing the house like the tragic heroine of a gothic novel only to disappear at the edge of the lake. The Samuel Whiting family occupied the estate in the 1920s after he won it in a poker game, if you can believe such things. 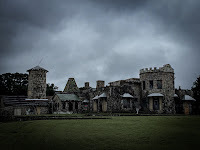 It was this family, lore tells, that began the slow process of crafting the original structure into a Texas castle, which was completed around 1940. This might explain why real estate information lists the construction date as 1940, the timeframe of its last incarnation. 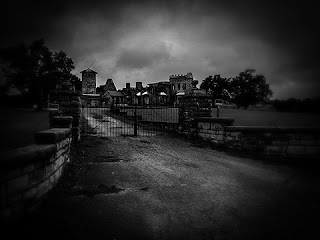 The story goes that the Whiting's youngest son committed suicide in the castle and he also is believed to haunt the location. A neighbor, Carmen Montoya, claimed to spy a young man in one of the windows, but before she could draw her husband's attention to the curious spectacle, the fellow had vanished. After the suicide of their son, the Whiting family leased the house to the Vultee Aircraft Corporation as a lakeside retreat for businessmen and clients. Among those rumored to have enjoyed its luxuries was Jimmy Stewart during the filming of "Strategic Air Command," which was partially shot at Carswell Air Force Base in Fort Worth. Side note: This is the air base to which the Roswell debris was taken in 1947. Just saying. In the 1970s, Tony and Marian May worked to restore the Castle, but their efforts were in vain: a fire destroyed much of their hard work. Throughout the years, there were other owners here and there. None stayed too long. Was the old, expansive structure just too much upkeep? Was its unique design and layout simply too outmoded for a time when newer was better? Or maybe, like that tragic bride, something dark and frightening chased them away from their dreams of a castle on the lake. 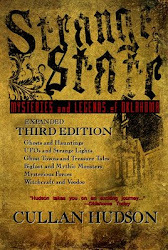 When the settlers of Roanoke Island seemed to have vanished, there were few clues left behind as to their fates. The most prominent and baffling of these has kept historians (armchair and otherwise) occupied for more than four centuries. At the settlement, carved into a wooden palisade, was the word Croatoan. John White, the governor of the Roanoke Island Colony believed this was an indication that the settlers had relocated to Croatoan Island, which lay 50 miles to the south. But it was also the name of a local indigenous tribe, so it isn't immediately clear what was indicated by the single word. Without context, it deepened the mystery. Did they relocate? Were they attacked? Did they move inland and mix with locals? To this day, theories compete and no one is 100% sure. But this isn't the only time, if stories are to be believed, that the word Croatoan (or some similar variant) has cropped up amid mystery and tragedy. Prior to his death, writer Edgar Allen Poe seemed to disappear. None of his friends or colleagues knew his whereabouts. When he returned, he was found stumbling in the street seemingly delerious, mumbling unintelligibly. It wasn't clear if he was drunk, ill, or injured. As he lay dying, one word did escape his lips clearly: Croatoan. It is said that the word also crops up in the journal of famed aviator, Amelia Earhart who vanished in the South Pacific in 1937. Writer Ambrose Bierce, who vanished in Mexico in 1913, left the word carved into the post of his bed just prior to his disappearance, if you believe such things. As well, notorious thief Black Bart was said to have carved Croatoan into the wall of his jail cell in 1888. Shortly thereafter, he was released and vanished into history. Is this all just bunk, manufactured retroactively to stich all these vanishings together with one weak thread? It's likely. If you scratch the surface on any one of these famous cases, you'll find evidence to support the Croatoan claim. For instance, Poe (who had a well-known drinking problem) was found mysteriously delerious in the street attired in clothes that weren't his own. He was taken to Washington Medical College Hospital, but the only thing he called out prior to his demise was the name "Reynolds," which remains a mystery to this day. No one is quite sure who Reynolds was, where Poe had been, and whose clothes he had been wearing when he was found. And if we look at Ambrose Bierce's disappearance in 1913, we see a 71 year old man who accompanies Pancho Villa into war-torn parts of Mexico. There is anecdotal evidence that he was killed in this tumult, perhaps by firing squad. And while there is some controversy as to whether he even accompanied Pancho Villa, it's clear that there is very little information regarding his disappearance, despite an official investigation by the US officials. What’s clear is there is no mention of Croatoan. I'm quite certain none of these claims are true. The bigger question is when did crotoan begin to be associated with these other disappearances? If you Google it, you can find many regurgitating this legend, but few fact checking it. Until I get better data, I'm calling this one a hoax, another Internet urban legend. 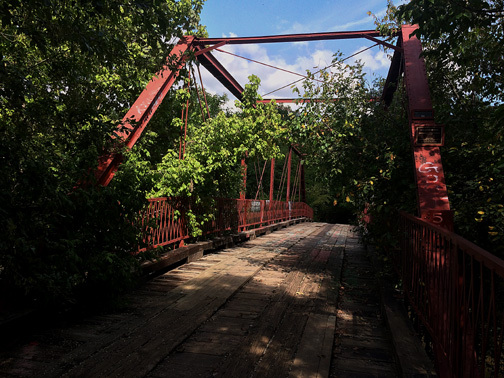 For some time now, the legend of Goatman's Bridge has drawn the adventurous and the curious to this abandoned steel trestle known officially as Old Alton bridge, which spans Hickory Creek in Argyle, just outside the North Texas town of Denton. But the truth behind its ghostly legend lies beneath murkier waters than even those of the muddy tributary that moves sluggishly beneath. In 1884, the King Bridge Company of Ohio built an iron bridge on Copper Canyon Road, just south of where the moribund settlement of Alton was established in 1850. For more than a century, this bridge served horses and automobiles alike. In 1988, it was placed on the National Register of Historic Places and continued to serve as a functioning bridge until 2001 when a new concrete structure was built only a few yards away on a new stretch of Copper Canyon Road. This change finally solved a formerly dangerous blind curve in the road that forced motorists to honk when on the bridge to signal their presence to anyone ahead. Legend has it that in the 1930s an African-American gentleman by the name of Oscar Washburn was doing pretty good business with his herd of goats, from which he sold milk, meat, cheese, and hides. He hung a sign from the Old Alton Bridge declaring: This Way to the Goat Man. Apparently his booming business ruffled the feathers of local Klansmen, so one August night in 1938 they stormed his abode and dragged him, noose in hand, to the Old Alton Bridge. There, he and his family was strung up and lynched for all to see. As there lifeless bodies swung pendulously in the night, the Klansmen noticed that Oscar's was empty. The rope was intact, but there was no body hanging from it. Moreover, there had been no splash indicating he had fallen to the creek below. Washburn had simply vanished—and he was never seen again. This disappearing act may be a folkloric calque lifted from a Texas legend said to date to the 1860s. In this tale, some good ol' boys in the Copper Canyon area lynched a goat-herding Creole slave by the name of Jack Kendall from a tree overhanging Hickory Creek. Unfortunately, while he swung there, his head and body separated and both parts fell into the muddy creek below. The men watched in horror as Kendall's body arose from the muck--through some unknown agency—to wade over to the shore where his goats were still corralled. Jack Kendall then wrenched the head off of one of his goats and supplanted his own missing head with the animal's horned pate. From here, the tales only get wilder. When cars could still drive over the bridge, it was said that if their headlights were off, they would encounter the Goatman on the other side. Others claim there has been an inordinate amount of abandoned cars near the bridge, their occupants were never found. Discarnate voices and growls are heard, as well as the sound of horse hooves and phantom splashing in the creek. Some have reported encountering glowing red eyes on the bridge and in the thick trees surrounding the area. It's said if you go at night, you can summon the Goatman with by knocking three times on the steel beams. But be careful! Legend claims that if you have a lineage of Klansmen or slave owners in your blood, you'll get dragged into the woods to face a hideous retribution. Some say when he manifests, the Goatman is a monstrous amalgam of a man with a goat's head. Truth be told, I find this addition ridiculous; he was only called the Goat Man because he owned goats--not because he WAS a goat. I think fantastical elements like this might be borrowed from other Goatman legends elsewhere in the country, such as Maryland's axe-wielding satyr that also goes by the name Goatman. There's also the Pope Lick Monster in Kentucky, which is said to be half man, half goat. The legend might also get confused with tales of the nearby Lake Worth Monster, which was described as a goat-man as well in the summer of 1969. There's also talk of a woman who haunts the bridge as well. Some have said she is Oscar Washburn's wife, while others claim she is an embodiment of the Mexican legend of La Llorona, the weeping woman who is associated with rivers and creeks and other bodies of water. She weeps for the children she lost to the murky depths. But these are all just myths in the grandest tradition. 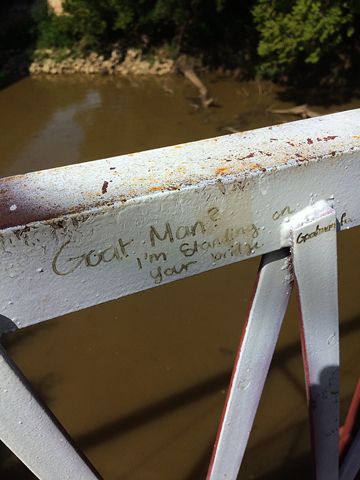 Urban legends designed to invoke delightful little shudders and goad the stalwart into doing the foolish: challenge the Goatman. In truth, there are no historical records to back up the tales of either Oscar Washburn or Jack Kendall. I doubt very much that there are any more broken down cars abandoned nearby than could be said of a hundred other places. When I visited, I had only the impression that (mosquitos aside) this was a nice place for a walk. Maybe my impression would be different had I crossed those old wooden boards at midnight to knock three times on the iron supports. Weird Street Bulge Indicated Monstrous Presence? It was Friday the 13th one hot July day in 1984 when a 20-foot long, 2-foot tall bulge appeared on the surface of a Fort Worth city street. The weird eruption snaked sinuously for a few moments, as if something alive were writhing beneath, before vanishing without so much as cracking the asphalt. Out of concerns that there might have been a rupture in a natural gas line, the city tore into street and tested for presence of any gasses in the soil. The results were negative and the various strata of soils beneath were uniform and undisturbed. Within a few short moments, the phenomenon ended leaving many, including fire fighter Charlie McCafferty, completely baffled. Could the sheer heat of the summer day have caused the asphalt to bubble up so dramatically? National Weather Service data shows that it broke the 100 degree mark that day, but it often does during a north Texas summer, so we’d expect to see such a phenomenon more often. Was there some other factor at work? Or did some subterranean creature make its presence known. 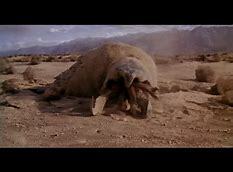 I'm picturing the creatures from the movie Tremors at this point. Along those lines, a tabloid at the time ran a story by a stringer named Frank Kendal that reported unnamed city officials were executing a "top-level investigation" of a giant earthworm terrorizing the city. It recounted that one resident, Calvin Lang, saw a similar formation appear on his land at the edge of town. He poked the bulge with a rake and it disappeared. Its passage through his property, however, damaged several buildings, fences, and even uprooted trees and shrubs. 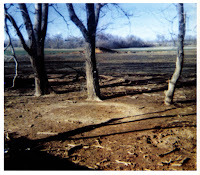 The tale continued when a man named Jeremy Boiter claimed to have seen a giant tentacle burst through the ground about 2 miles away from Lang's place. It snatched several cats and a couple of dogs in its "slick, dripping mouth." Another local, Phil Dewar, claimed to have seen scraps of birds lying about. There seems to be some evidence, scant as it is, that the original weird bulge in the street really occurred. It was covered by reputable papers of the time. However, the further Lovecraftian embellishments provided by the National Examiner might simply be the typical sensationalism such rags are known for. For instance, the fire fighter named in the account wasn't aware of the fantastical elements related by the Examiner until the following winter when two frightened women phoned him regarding the creature they had read about in the tabloid. Either way, the Summer of the Bulge (as I'm terming it) was quickly over with no other incidents reported since. Delphos, Kansas is an innocuous farm settlement in the north central part of that state, hardly the place one expects a headlining bit of weirdness. But that's just what it's known for. And not just once. Delphos has two weird tales to share and to this day, some wonder if there isn't a connection. 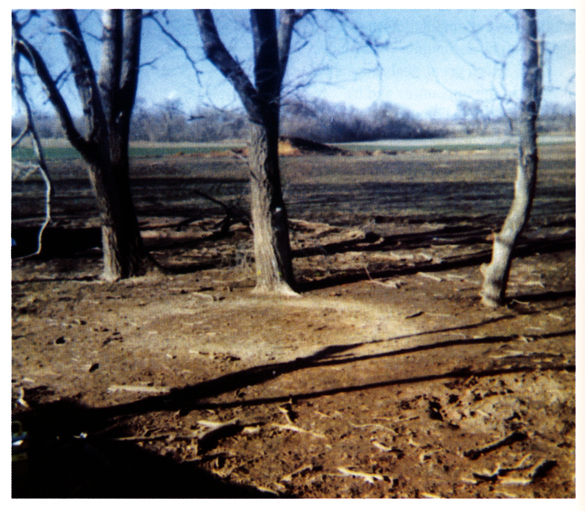 On November 2, 1971, 16 year-old Ronald Johnson was tending sheep at his family's property when a sudden rumbling drew his eyes to a copse of trees about 75 feet from where he stood. Within the stand, he could make out a strange, mushroom shaped object that was about 8 feet in diameter with blue, red, and orange lights. The object hovered about 5 feet off the ground for several moments, before emitting a brilliant, blinding glow from its underside, and rocketing away with a high pitched whine. The teen's parents managed to catch a glimpse of the object high in the sky before it vanished in the distance. After it was gone, the family walked over to the woods where they discovered a glowing white circle of crystallized soil. Mrs. Johnson picked some of it up and was disturbed to feel her fingers going numb. When she tried to brush it off on her leg, that portion of her leg also became numb. Soil samples obtained by Ted Phillips, a UFO investigator, were tested by various labs. It was reported that these tests indicated the presence of a peculiar fungus as well as an unknown crystalline structure. An English chemist, Dr. Erol A. Faruk, analyzed the soil and concluded it had been sprayed with a luminescent chemical. Ronald also suffered from exposure to the circle. He complained of headaches and nightmares. He also said that his eyes hurt from the intense light burst given off by the departing craft. As time progressed, he also claimed to develop psychic powers. Shortly after the sighting, the boy claimed, he encountered a blonde haired 'wolf girl' in a torn coat. He tried to approach her, but she ran away on all fours. One wonders if Ronald wasn't inspired in the addition to his tale by events that happened earlier that year in Mobile, Alabama when residents of one neighborhood began reporting a 'wolf woman' stalking about at night. Witnesses described her as having the torso of a woman and the legs of a wolf. While the furor might have died down thereafter, two and a half years later, one strange aspect of Ronald Johnson's tale would return to affect the entire town of Delphos. Early on the morning of July 22, one Mrs. Stout spotted the child, whom she described as being about the size of a 6 year-old boy, sitting on a picnic table within a storage shed. Within, Stout could see dolls and clothes that had been previously stored away strewn about. Stout managed to approach the girl to within 5 or 6 feet before she fled through a small hole in the wall of the structure. Stout could see nothing physically wrong with the girl, but she did have a crescent shaped scar running from her right eye to the edge of her mouth. Stout also noted that the girl fled on all fours. Mrs. Stout spotted the girl twice more that same day as townsfolk gathered to hunt for the wild child. In the evening, Stout was scratched on the shoulder, but barely saw her assailant before the girl dissolved into the night. Another local on the hunt that night, a young man named Kevin Marsh, was also attacked, receiving a scratch on the throat from behind. He, too, scarcely saw the girl before she vanished. Locals were on edge after the attacks. They began keeping their children indoors. Sheriff Simpson and his department followed up calls from Delphos residents, but never managed to apprehend the strange child. She was chased through a grain field, but there was no sign of her. She was reported by locals to be holed up in a shed that locals had surrounded. By the time the officers arrived, she had somehow vanished again. The sheriff was beginning to have his doubts that there was any child at all, that it was perhaps some mass hallucination of the misidentification of a wild animal. Many of the witnesses would later recant their tales when pressed to make official statements. Whether this speaks to the veracity of their statements or their comfort with any publicity, isn't easy to discern. Eventually, Sheriff Simpson closed the case. In time, the sightings dwindled and then vanished. The wolf girl hasn't been seen since. It is extraordinary to me to think that I had lived so long in the world without realizing the existence of a whole section of its inhabitants - the Gremlins. I am no longer operational aircrew, but I did three hundred hours war flying in the last war, and never heard the creatures mentioned. I was with a Coastal Command squadron for the first six months of the present war - then in France on an odd sort of racket - then in various RAF training stations, for almost a year on end. Still I never heard a hint of that strange word or of those strange little people. Quite by chance, I found myself in Northern Russia with an RAF fighter wing. Gremlins suddenly became an accepted fact of life. They were discussed quite freely on every hand. Their merits and de-merits were argued about - just as though they were actual people, sent to try us. It was late at night in our room of the gaunt officers' barrack-block that we called the "Kremlin"- (fitting rhyme to Gremlin) that I first heard the Gremlins mentioned. The two fighter-boys who shared the room with me were deep in discussion about them. In my capacity as Wing-Adjutant it seemed to me that I ought to know everything that was going on, and I asked about the Gremlins. They explained them to me as one explains something to a half-witted child - as one explains something that is already perfectly well known to everybody else, without wishing to hurt the half-witted child's feelings. One of the pilots said: " Oh, they get out of clouds and run up your wing-tip - the wrong wing-tip." The other added: "If you're taxiing, they run down the nose of the machine and tip you up and you prang a prop, if nothing worse." That was about as far as I got that night. A new subject was opened up for me. The "they" was significant. They run out of clouds. They tip you up on your nose, etc. Obviously they were a sort of collective unity. They operated in droves or swarms. Was it hundreds of them, or at least scores, that " ran out of clouds" or in landing, upset the balance of the aircraft? One imagined them about the size of mice, or at biggest, the procession of rats led by the Pied Piper of Hamelin. Next night I heard from Mickey Rook, in casual conversation in the Mess, about a new type of Gremlin - the Spandule or Ice-Gremlin. "He takes over at 10,000 feet. Gremlins proper only operate lower down. They can't get the height." Further, of the Spandule, from all the pilots in the Wing, "He's a pig; he's the one you've got to watch. He'll do you down if he can." But still it seemed a collective type, quite small, operating in mass rather than individually. Since those days, a mountain of documentary evidence seems to have accumulated. Apparently there are Mediterranean Gremlins as well as East Fifeshire Gremlins. Pilots of every branch and Command of the Service seem to be on nodding terms with them. Their habits are a matter of day-to-day discussion. There has grown up a mass of Gremlin-lore, and even of Gremlin literature. The R.A.F., always by far the most inventive of the Services, seems to have taken the Gremlin - if not to its heart - at least into its inner consciousness. (Nor are Gremlins, it appears, by any means always malevolent. "They can be playful. They have a sense of humour even if a distorted sense of humour." My authority is again Mickey Rook.) There have been Gremlins known to come to one's aid in moments of emergency, though this latter type seems to be in an extremely small minority. It will be noted that even with the evidence now to be tendered, very few members of air-crews claim to have actually seen a Gremlin. The outward and apparent shape still remains a mystery. The tribe of air gunners said to he in the habit of actually inviting a gremlin into their rear-turret, must obviously envisage him as something fairly big, say, knee-high to an air-gunner for the presence of a single Gremlin to provide companionship and warmth. On the other hand, those alleged to be airborne, cross-legged between the knees of a seagull, must be almost flyweights, for the payload of a seagull is comparatively small. Though you boost and you dive and you fink. They'll insert toasting forks in your tyres. But fact, none the less, to the few." A correspondent recently wrote to the Editor of the Journal: "Gremlins, the mischief-makers of the air, are encountered in the flying history of nearly every R.A.F. pilot. Their pranks are responsible f6r a large number of accidents which would otherwise be inexplicable except as lapses on the part of the pilots. 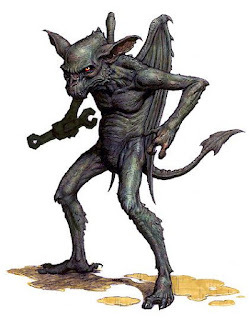 Gremlins are believed to have originated in the Middle East where, long before the war, they made themselves something of a pest to many pilots, especially those of flying boats. They were reported on wingtips, on floats, on propellers, and in the aircraft. One particularly virulent species of Gremlin, apparently living in the clouds, had a habit of entering aircraft in bad visibility. When the pilot had been flying for some time in cloud, without being able to catch a glimpse of the ground, the Gremlin would skip on to his shoulder and whisper in his ear: 'You silly fathead - you're upside down! Of course the pilot wasn't, but it unnerved him and made him jumpy." Now fresh evidence is available on the Gremlin mystery, which is one of the most fruitful subjects for discussion in any R.A.F. Mess. It is believed that the Gremlin found in the neighbourhood of the Rock is, generally speaking, of the hairy-footed variety with extremely large, rudimentary ears fastened to the head (in the case of the male) by a peculiar scaffolding of gristle about eight feet long. The abdomen is pierced with triangular holes through which the wind whistles when in flight." The report adds that it is very important to ensure that no one enters an aircraft in a Gremlined condition, i.e., he must not be seeing Gremlins before he is airborne. The most recent evidence, gathered in the last few weeks, comes from a small and hard-working body of eminent Fife Gremlinologists. "In our opinion," they write, "the creatures observed in the Gibraltar area can scarcely be called true Gremlins. The are probably to be regarded as belonging to a distantly related species peculiar to the warmer conditions obtaining in the Mediterranean zone. Some, but not all Gremlins, possess the faculty of sitting motionless on the wings of an aircraft until it is close to the British coast. They then slide down the wireless directional beam, reach the aerodrome ahead of the aircraft, and jerk the runway from under its wheels, the pilot being unable to tell whether he is on his course or his elbow. The second point is even more serious. It has come to our notice that Gremlins are in the habit of creeping in beside air-gunners in a confiding and ingratiating manner which the simple-minded air-gunner finds hard to resist. Air-gunners have even been known to invite Gremlins into the turret for' the sake of extra warmth. Air-gunners - is it worth it? No sooner does the pilot adjust his elevators to counter the increased load in the tail than the cunning Gremlins rush forward into the nose of the aircraft with the obvious intention of causing it to dive into the sea. Gremlins have also been known to incite seagulls to attack aircraft. In this form of indirect attack, the Gremlin sits cross-legged between the seagull's wings until a collision becomes inevitable, when he abandons the seagull, gains cloud cover, and, chuckling throatily, sets course for base. All aircrews are advised to keep a sharp look-out for seagulls suspected of harbouring Gremlins. The attitude of Gremlins has recently changed from hostile neutral to hostile non-participant, verging at times to one of hostile-non-belligerency. The moment is approaching when the Gremlins should ask themselves-Are they for us or against us? Or what? Perhaps, after all, the curious subject of Gremlins is one for Mr. H. G. Wells. He should have invented them. He should have written stories about them. His very titles seem to fit in with the curious and evocative word,- " Mr. Gremlin Sees it Through," Gremlin and Peter," "An Outline of Gremlin History," "Tono-Gremlin," and, most sinister of' all, " The Shape of Gremlins to Come "
"The whole thing is, they more or less reflect your mood: -if you fly carefully and well, they treat you good-if you fly badly, they act badly by you." One may let the matter rest there for the present. In the Santa Lucia Mountains of California dwells a nebulous, and obscure legend regarding the Dark Watchers. Seemingly arising from Chumash legend, these shadowy figures inhabit the mountains and are described dark or black. In native legend, there isn't a sense of malice from these entities; they simply exist. However, as they are further related and embellished by non-natives, they take on a more sinister aspect. "When thou comest to the high mountains, if thou seest any of the dark watching men, go not near to them nor try to speak to them." "Once, on a white barren spur, he saw a black figure for a moment; but he looked quickly away, for it was one of the dark watchers. No one knew who the watchers were, nor where they lived, but it was better to ignore them and never to show interest in them. They did not bother one who stayed on the trail and minded his own business." Later, Steinbeck's own son would echo this in a book called "In Search of the Dark Watchers," which was based on tales his grandmother told. Another local writer, the poet Roberson Jeffers, wrote of The Watchers in his "Such Counsels You Gave To Me," which he described as being not quite human. 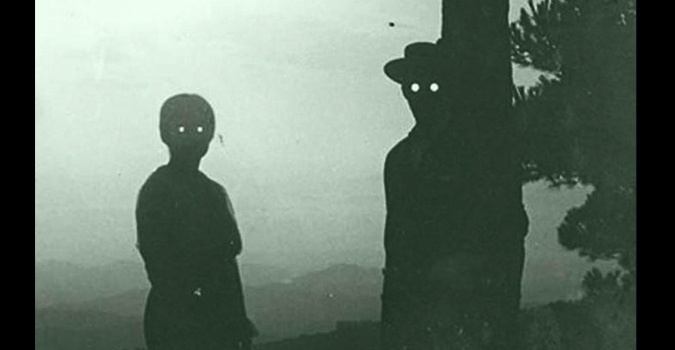 Some more recent accounts liken them to legends of Shadow People or the Hat Man myth in that they seem to be clad in garments and wearing hats. 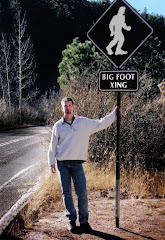 The older reports are less specific and could either be talking about actual shadow entities or perhaps native legends of sasquatch-like creatures or simply spirits of the mountains.